The global commercial robotics market has grown by leaps and bounds in the last few years due to the growing use of robotic solutions in a number of industries. Robotic devices offer significant benefits over conventional techniques in a number of industries, which is likely to enable smooth growth of the global commercial robotics market in the coming years. The global commercial robotics market is thus set to prosper from the rapid growth of the industrial sector in a number of countries, including developing regions. According to Transparency Market Research, the global commercial robotics market is set to rise to a 2022 valuation of US$17.6 bn at a strong CAGR 24.4% over the 2017-2022 forecast period. The commercial robotics market is set to be valued more than US$5.9 bn by the end of 2017. By product type, the global commercial robotics market is segmented into medical robots, drones, autonomous guided robots, field robots, and others. Of these, medical robots are likely to remain the dominant product segment of the global commercial robotics market in the coming years. The medical robots segment of the global commercial robotics market is expected to be valued at US$1,925.2 mn by the end of 2017 and further rise to US$3,916.6 mn by 2022, accounting for 41.3% of the global commercial robotics market. The absolute growth of the medical robotics field represents an annual growth of US$398.3 mn, more than any other product segment of the global commercial robotics market. Autonomous guided robots and drones are also likely to witness significant demand in the commercial robotics market in the coming years. Geographically, the global commercial robotics market is set to be dominated by North America in the near future. The North America commercial robotics market is likely to grow to more than US$2.6 bn by the end of 2017 and further rise to US$7.6 bn at a 24.1% CAGR from 2017 to 2022. North American players have managed to retain a dominant position in the global commercial robotics market due to the pioneering role played by North America in the development of robotics technology. The Europe commercial robotics market is also likely to play a major role in the global commercial robotics market. The region is likely to create an absolute opportunity worth close to US$3 bn over the 2017-2022 forecast period, making it a major regional entity for players looking to establish a firm foundation in the global commercial robotics market. Japan is also likely to be a major player in the global commercial robotics market in the coming years, with the regional market set to rise to US$899.8 mn by 2022 at a 21.7% CAGR between 2017 and 2022. 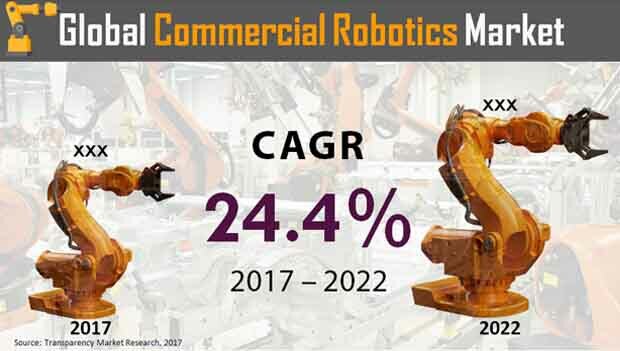 Emerging economies in Southeast Asia and the Middle East could also prove vital for the global commercial robotics market, with the MEA market for commercial robotics expected to exhibit a strong CAGR of 22.7% from 2017 to 2022, rising to a valuation of US$471 mn. Leading players in the global commercial robotics market include Northrop Grumman Corporation, KUKA AG, iRobot Corporation, Yaskawa Electric Corporation, Honda Motor Company Ltd., Omron Adept Technologies Inc., 3D Robotics Inc., Accuray Inc., Alphabet Inc., and Amazon Robotics LLC. The dominant players in the commercial robotics market are likely to focus on acquisitions of smaller players as a successful way to grow. The global commercial robotics market report describes an up and coming market in great detail. The historical growth trajectory of the commercial robotics market has been rampant, aided by a number of key economic factors. The future of the commercial robotics market thus represents significant investment for many major players in the market. Historical information about the 2012-2017 growth of the segments of the global commercial robotics market is used to establish a solid foundation for forecasts regarding the commercial robotics market’s growth potential in the coming years. The predictions are backed by the use of industry-standard analytical models and data gathered from primary and secondary sources. The report thus becomes a must-have accessory for any player attempting to expand their presence in the global commercial robotics market in the coming years. According to Transparency Market Research, the global commercial robotics market is likely to be valued at US$5.9 bn by the end of 2017 and further rise to US$17.6 bn by the end of 2022, exhibiting a robust CAGR of 24.4% therein. The commercial robotics market is propelled primarily by the growing realization of the benefits robotic devices provide over conventional techniques in a number of sectors, which has enabled a steady growth in demand from the global commercial robotics market in the coming years. The report provides readers with a clear picture of the various factors affecting the growth trajectory of the global commercial robotics market in the coming years, describing in detail the major currents to jump into in the commercial robotics market as well as the pitfalls to avoid. Information about the drivers and restraints affecting the global commercial robotics market is backed by detailed data illustrating the trend in action. The leading segments of the global commercial robotics market are profiled in the report to provide readers with a clear idea of the competitive hierarchy of each section of the market. This detailed information about the hierarchy of the commercial robotics market provides readers with a clear picture of the granular dynamics of the market and the potential of various parts of the market. The report segments the global commercial robotics market by type, application, and environment to provide a comprehensive look into the market. The geographical segmentation of the global commercial robotics market is also elaborated upon in the report. Geographically, North America is likely to remain the dominant contributor to the global commercial robotics market, while medical robots are likely to remain the leading product segment of the market. Other leading product types in the global commercial robotics market are autonomous guided robotics, drones, field robotics, and others. The leading end use sectors of the global commercial robotics market include defense, rescue, and security, agriculture and forestry, medical, marine, and others. The report assesses the various factors affecting the competitive dynamics of the global commercial robotics market in the coming years. The leading players operating in the commercial robotics market are profiled in the report, including information such as the product development strategies developed by the companies and their geographical presence. Leading commercial robotics market players profiled in the report include Northrop Grumman Corporation, KUKA AG, iRobot Corporation, Yaskawa Electric Corporation, Honda Motor Company Ltd., Omron Adept Technologies Inc., 3D Robotics Inc., Accuray Inc., Alphabet Inc., and Amazon Robotics LLC.